After breakfast we will depart for Merzouga through the Middle Atlas region. We will drive through Ifrane, the ‘Switzerland’ of Morocco and the cedar forests of Azrou where we can stop to hand feed the indigenous Barbary monkeys. We will continue to Midelt where we will have lunch. We will then follow the Ziz River through the valley and stop to see the Ziz Gorges on our way to Merzouga. 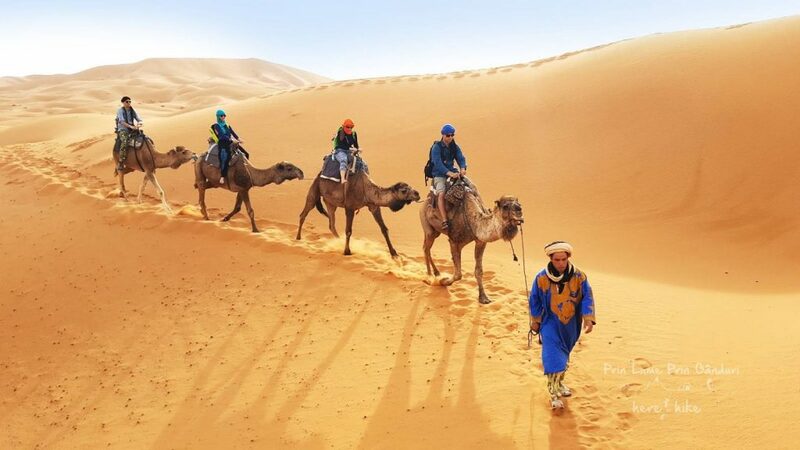 Today we will explore the desert region and the marvel that is the Erg Chebbi desert dunes. We will make a circuit of the desert dunes where you will have the opportunity to see the nomad’s way of life and the amazing changing contrasts of the desert. We will visit the ‘black village’ of Khamlia to see the Gnawa musicians. We will have a traditional Berber pizza for lunch in the ancient capital of Rissani. In the afternoon we will ride the camels to see the sunset over the dunes and spend the night in the desert camp. We will have a traditional tagine dinner, drink delicious mint tea, listen to traditional Berber music while watching the stars and the rising moon in the amazing Sahara desert. We will wake up early to see the spectacular sunrise over the dunes before making our way back to the hotel for breakfast and a shower. We will cross the palm oases valleys of Tourog and Tinjdad to arrive at Todra Gorge. 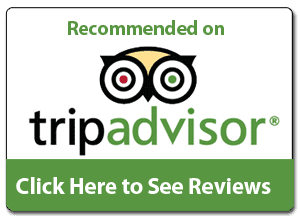 We will take a walk in the Todra Gorges and have lunch in a local restaurant before continuing to our accommodation in the Dades Gorge. After breakfast we will take a walk in the gorge and then take the off road track to see the nomad caves. We will continue via El Kelaat M´gouna, Valley of the Roses and the Skoura oasis to arrive in Ouarzazate. 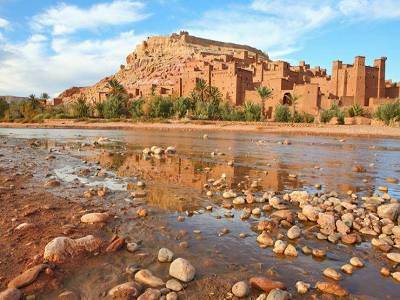 After breakfast we will visit Taourirt Kasbah before departing for Ait Benhaddou to visit the UNESCO World Heritage Site. We will continue with a visit to the traditional High Atlas Berber village of Telouet and the Kasbah el Glaoui. We will have lunch in a local restaurant in Telouet before descending via the Tizi-n-Tichka pass to Marrakech.